Danny J. Salchert Executive and Advertising Offices 2009 Eagle Ridge Drive Birmingham, AL 35242 phone: 205.981.4541 fax: 205.981.4544 www.epsmag.net • danny@epsmag.net Electrical Products & Solutions™ is published twelve times a year on a monthly basis by ABD Communications, Inc., 3591 Cahaba Beach Road, Birmingham, Alabama, 35242, USA. Electrical Products & Solutions™ is distributed free to qualified subscribers. Non-qualified subscription rates are $57.00 per year in the U.S. and Canada and $84.00 per year for foreign subscribers (surface mail). U.S. Postage paid at Birmingham, Alabama and additional mailing offices. 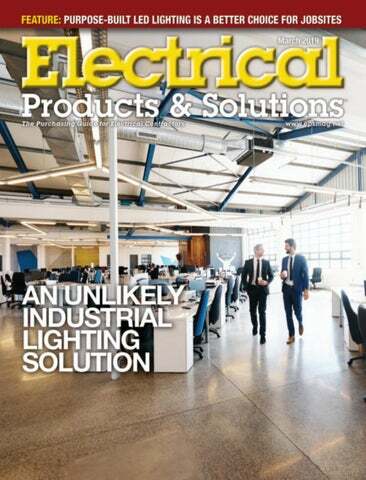 Electrical Products & Solutions™ is distributed to qualified readers in the electrical contracting industry. Publisher is not liable for all content (including editorial and illustrations provided by advertisers) of advertisements published and does not accept responsibility for any claims made against the publisher. It is the advertiser’s or agency’s responsibility to obtain appropriate releases on any item or individuals pictured in an advertisement. Reproduction of this magazine in whole or in part is prohibited without prior written permission from the publisher. ON THE COVER Photo courtesy of Chalfant Mfg. port chains, hangers or conduit. The wires and cables can run through the tray and directly into the fixture all completely out of sight while providing a key design element. Cable trays also offer a number of additional benefits such as their ability to act as an equipment ground conductor (when you select a UL classified brand) or available corrosion resistant finishes such as zinc galvanized, stainless steel and powder coated options (in any RAL color). The usefulness of cable trays does not end with supporting light fixtures, they can also be used to hide pipes, tubes, wires or other unsightly fixtures in an exposed ceiling. In the interior renovations and expansion at a renowned college in Wellesley Massachusetts, we worked with a prominent Philadelphia architect who brilliantly used our cable tray system to hide unsightly pipes as well as support light fixtures. We performed stress tests at our in-house certified test center to ensure the tray was robust enough to support the light fixtures mounted to the bottom. The final design called for our ventilated tray in a white powder coat finish and used our concealed hangers. At another university interior renovation an architectural firm wanted to use our tray to conceal the water pipes of the sprinkler system. The design called for holes to be cut in the bottom of the tray where the sprinkler heads were mounted. Because the tray was not used as a structural or mechanical support the installers were able to take liberties with the installation of the tray such as making larger Continued on page 10 than normal cut outs. Workers can be exposed to these toxins having the right lighting equipment on site. when bulbs break. Also, when bidding new jobs, this information can provide a competitive adHow Projects Benefit vantage. Contractors who have an accurate Lighting is a necessary but often over- bill of materials for lighting can easily callooked component of an overall project. culate the estimated energy savings to inEven though bulb-based lighting is clude in project bids. cheaper upfront, it will end up costing the Electrical contractors who choose qualproject much more in the end with in- ity LED products for jobsite lighting can creased labor, materials and energy costs. create a win-win for everyone on the proLED lighting will help a jobsite run more ject—the project owner saves money, laefficiently. borers save time and contractors gain a A real-life example of the savings that value-added service. When selecting jobcan occur with using purpose-built LED site lighting, be sure to ensure products jobsite lighting is the Keeyask Project, a meet all regulatory OSHA requirements, 695-megawatt (MW) hydroelectric gener- carry the proper electrical certifications ating station located about 450 miles north and are approved for outdoor use. ❏ of Winnipeg on the lower Nelson River in Canada. Reducing energy usage during About the Author: Brian Astl is construction is a great concern on this site, president of Lind Equipment, home of as it is in a remote location and power The LED Jobsite, Williamsville, N.Y., costs are at a high premium. This project is and Markham, Ontario, Canada. He can using LED jobsite lighting and has so far be reached at BAstl@lindequipment.net realized more than $300,000 in electricity or 877.475.5463 x 224. Astl holds an savings. Live tracking of the environmen- MBA from Harvard and is a recipient of tal savings can be found at http://www.led- the Clean50 award, which offers jobsite.com/keeyask-dam-led-jobsite. recognition to Canada’s leaders in sustainability. For almost 70 years, Lind Equipment has manufactured portable lighting and electrical equipment for the toughest jobsites. Established as leaders in LED construction lighting, Lind Equipment uses groundbreaking engineering to keep prices affordable for the contractor while increasing quality in durability and functionality. For more information, contact 877-475-LIND, info@lindequipment.net, or go to www.ledjobsite.com. View our live counter of reduced energy usage and reduced carbon emissions or our video. much larger when you replace the entire luminaire. With LED technology, contractors can choose to either make a modest investment or enjoy the benefits of a brand-new fixture, warranty and aesthetic. They have complete flexibility to choose the option that bests suits the application. ❏ Bill Brosius is vice president of key accounts and business development at Universal Lighting Technologies in Nashville, Tenn.
tionally known for their quality equipment. Otex Protective is becoming more known for their quality clothing. For years, they have manufactured their products under other provider labels. Vince chose to not create his clothing line, but to sell the manufacturer product. Vince has worked with many electrical company employees to fine-tune the clothing to be more comfortable for the user. Working closely with the manufacturer, they have made slight changes in how the cloth pattern was modified to meet final production. An example is the lightweight 40 Calorie vented hood offered by Otex. The material is of the latest technology. The vented assembly is constructed for balance on the back of the hardhat and the airflow is 27 CFM to prevent fogging of the face shield and provide cooling to the worker. It took over a year to develop the product with the user prior to having the hood “flash tested”. This product is now standard issue with many electrical contractors. Being a small business and having quality providers has resulted in satisfied customers for Miller Safety Consultants. Being a direct supplier for OTEX Protective, another small business means customized customer needs can be met. ❏ For more information, visit Miller Safety Consultants at: www.electricalsafetysupply.com, email Vince at: sales@millersafetyltd.com or give him a call at (703)367-0404. Mike Neal, Thea & Schoen, Inc. Jay Commuso, I-Pro, Inc.
About Douglas Lighting Controls: Douglas Lighting Controls, a member of the Panasonic group and a subsidiary of Panasonic Lighting A mericas Inc., engineers, manufactures and markets digital lighting controls for commercial buildings, campuses, parking garages and sports complexes across North A merica. Douglas systems include networked and stand-alone solutions using wired and wireless technology to optimize lighting for building code compliance, energy efficiency, ease-of-use and comfort. W ith over 50 years of experience, the company is recognized for its expertise in lighting control systems paired with the precise facility solution. Learn more about Douglas at www.douglaslightingcontrols.com. This advertisers index is compiled as a courtesy to our readers. While every effort is made to provide a complete and accurate listing of companies, page numbers and reader service numbers, the publisher is not responsible for errors.